It’s been a while since I’ve done any book reviews. Not that I haven’t gotten any books that I have loved and want to tell you all about, just have been busy! But that stops now. I have a backlog of amazing books that you NEED to know about. The first one I want to share with you is All-American Paleo Table by Caroline Potter of Colorful Eats. How many of you have been faced with a diagnosis which specifies that you can’t have something anymore? Whether it is a particular food or foods, a way of life, a sport, etc? It’s not fun, right? Well, Caroline was diagnosed with Type 1 Diabetes at the age of 20! So young, with so much of her life in front of her. After a dark period she discovered grain-free/Paleo eating to help control her condition and has never looked back. However, she had a lot of emotional ties to special occasion food (don’t we all?) and just things we do as Americans. Tailgating, Thanksgiving, fried chicken (because that’s an event in itself), you name it, she was scared that she’d never be able to enjoy these things again once she realized what she needed to do to stay healthy. So she set about re-creating those favorite foods for this book. I love a quote she uses to describe the book “When it comes to food and celebrating, no one should ever be left out”. As a mom of a 3 and 6 year old, both of whom we assume are Celiac (because both my husband and I are), that really hits home. I want nothing more than for my children to feel included in everything they do, so the more Paleo recipes that come out that recreate foods everyone else celebrates with, the better. Fried Banana French Toast on the morning of a birthday? Sign us up! This book is much more than just celebration food though. There are lots of classic American dishes from Cinnamon Swirl Coffee Crumb Cake to Chicken Pot Pie and Biscuits, to Grilled Mahi-Mahi Fish Tacos, to Hot Dogs on a Stick, to Maple Sugar Christmas Morning Cinnamon Rolls. Over 100 recipes and ALL are low in sugar due to Caroline’s diabetes. If you can’t tell by now, I love this book, and let me take a minute to gush about the photography. The photos in the book are incredible. If you are one of those people, like me, who love to flip through a cookbook and get inspired from looking at all the beautiful photos, then this book is definitely for you. Seriously, looking through Paleo cookbooks has saved me many a time from falling off the wagon or wallowing in my sorrows that I am grain-free because I am reminded about just how gorgeous and delectable Paleo food can be. A book like this makes a PERFECT gift for that person in your life that is either Paleo or thinking about it but isn’t sure they’ll ever be able to eat anything fun or special again. Or that special someone who has just realized their health isn’t up to par but that whole Paleo diet thing sounds way out there. This book shows that it’s not. This book is exactly what I had been hoping for when I had first started my first grain-free diet over 4 years ago and was feeling hopeless and in despair that I’d never again bake a beautiful cake or have a biscuit smothered in jam with breakfast (oh man, when is my Whole30 over???). Basically, this book makes healthy food look amazing. It makes you WANT to be Paleo. It gives you hope and inspiration that healthy eating is not a terrible sentence to endure. We can have our cake AND eat it too! Who this book is for: Anyone wanting inspiration for what Paleo can be, desire for recipes of delicious and comforting foods, anyone who might entertain others via meals, parties, formal and informal gatherings, and people with at least a basic understanding of cooking. Caroline generously agreed to share a recipe from the book with you, and I thought that these Buffalo Chicken Meatballs would be perfect with the football playoffs and Super Bowl coming up in the next few weeks! You could eat these as a snack or as a meal. This Paleo and Whole30 recipe is from All-American Paleo Table by Caroline Potter and is shared here with her permission. 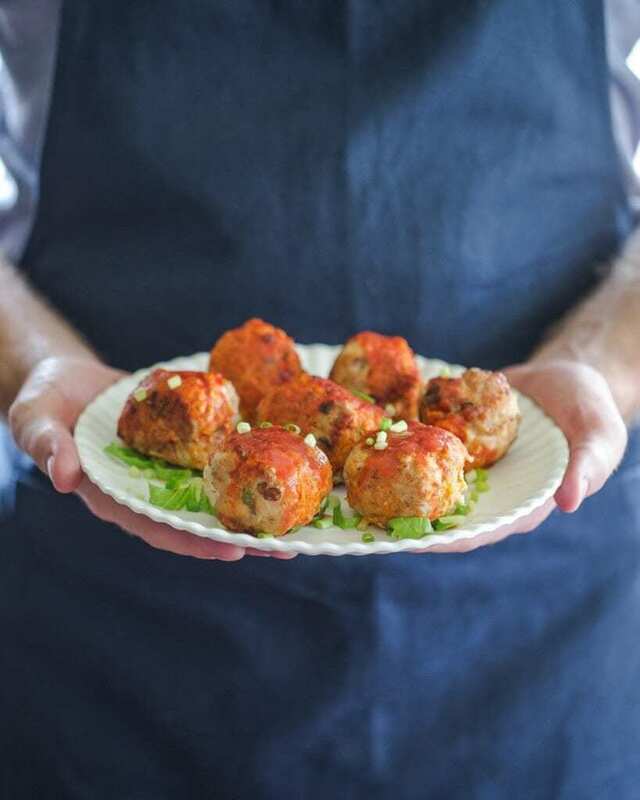 This is a creative twist on the classic buffalo chicken wings, made into meatballs instead! These are perfect for game-day festivities because you can wrap them in foil and keep them warm until you are ready to eat. They’re packed with flavor and a bit of heat, and delicious served over a bed of arugula with blue cheese crumbles or Creamy Ranch Dressing (page 168 of the cookbook). Preheat the oven to 350°F and warm a large nonstick skillet to medium heat. In the bottom of a mixing bowl, sift together the almond flour, salt and garlic. Add in the ground chicken and green onions. Use your hands to mix together the meat, incorporating all the ingredients, but be careful not to over mix because the chicken will become gummy. Lightly grease your hands with coconut oil, shape the chicken into small meatballs and set them aside on a plate. If the chicken becomes too difficult to work with, wash and re-grease your hands. Drizzle the olive oil in the warm skillet, swimming around to coat all sides of the skillet. Sear the meatballs for 8 minutes, rotating every 2 minutes so that all sides are seared. Transfer the meatballs to a baking dish, placing them close together so that all sides are touching. This is easiest if the baking dish is similar in size to the meatballs; I find that a 9 by 13 inch dish usually works well. Pour the hot sauce over the meatballs and place in the oven. Bake for 20 minutes. Serve over a bed of arugula with blue cheese crumbles or Ranch Dressing. If you cannot find ground chicken, most butchers will freshly grind chicken thighs for you. Just ask!